You know you are in a difficult part of the world when the flag that flies changes along the road from one set of colors to another and you have not left the country. We began the day where the Syrian flag flies and headed north and east about sixty miles to where Kurdish colors are flown. Land is contested here; it is relinquished involuntarily and yet it is relinquished. As Firas explained, this part of Syria up in the northeast tucked between Turkey and Iraq is historical ground. It was here that the Christian remnants of the Ottoman Empire fled from the genocide committed against them one hundred years before. Armenian, Assyrian and Chaldean brothers and sisters were systematically slaughtered by the Ottomans through the hands of the Kurds. In this war the Kurds have helped to drive out ISIS and other radicals, but have taken the land for themselves. The Evangelical and Orthodox Christians remember the stories and they fear for their children and their lives, so many have left. That is the context of this place. Hearing and absorbing the historical aspect of this place and the lives of these people, we left Qamishly for Malkieh, the farthest north and east we could go and the home of another Presbyterian church. Through many checkpoints all book-ended by speed bumps, we made the nearly two hour drive north. We went past the place where Firas’ church had helped to dig a well for Yazidi people in 2014. These people had relinquished their lands when ISIS took control of Mosul in Iraq. We even drove to the farthest place we could, Ain Dawar, and looked over the valley cut in two by the Tigris River. To the west was Turkey, to the east was Iraq, and south of the river was Syria, albeit controlled by the Kurds. Land is relinquished by the river as it changes course. One day its identity is Turkish, the next a flood may change it to Syrian, and so it goes. But the main part of our day was to be with the church in Malkieh. I had names and faces of women I had met at previous women’s conferences in Lebanon on my laptop and my phone and I was looking to hug and kiss them here in their place, their home. Three in particular had made a lasting impression in 2015 because of their names: Sameeya, Samia and Samiha. Samia greeted us upon arrival with those hugs and kisses, but from her we learned that Sameeya and Samiha had left for Sweden. We knew that Sameeya’s family had relinquished their business to Kurds when the Kurds pushed ISIS out. It had cost them dearly, their lives forever changed by the loss. Her children had left for Sweden; her husband had fallen into a deep depression. Firas had told us that the Kurds would look for young men to conscript into their army, so that had much to do with the children emigrating as well. Sameeya could not even attend her daughter’s wedding. The family had lost so much, and now she had finally left to be with her children. Before her husband could join her, he was killed in an accident. And yet with all this sadness, we experienced the joy and life of the church. We shared coffee and sweets. We were treated to a lavish lunch with traditional Syrian dishes followed by more coffee back at the church. And then we headed to sweet worship on a Thursday night. They normally worship on Sunday here, but because we had come they turned out to worship with us on a work night and school night. I would like to think we would relinquish a night like that at home for the same reason, but I doubt we would. We listened to a large group of children and young people sing Christmas songs in a church hall still decorated with a tree and trimmings in February. All dressed in red and white, they left quite an impression with their smiles and choreography! They also sang a song seeking justice for the victims of war. Pictures of children just like them appeared on the screen as they sang. Without knowing the words, we understood the message. Our own Rev. 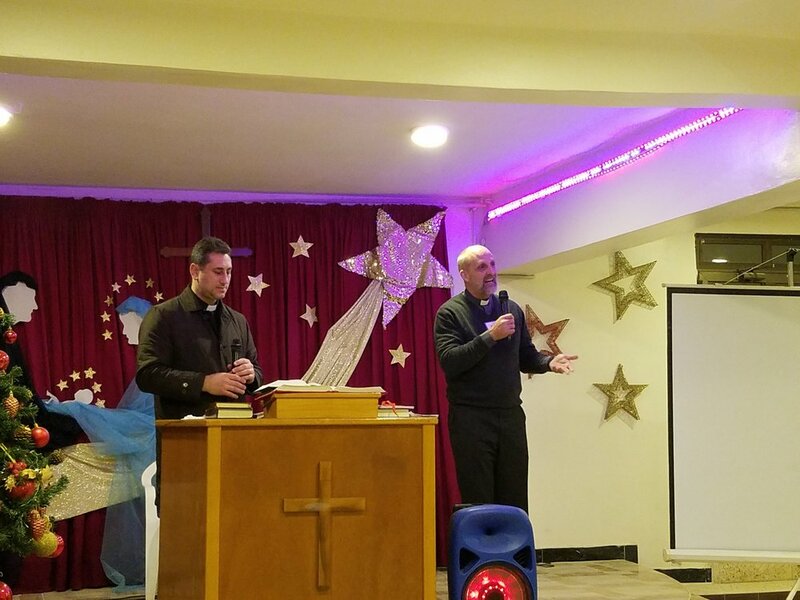 Mike Kuhn, fluent in Arabic, had graciously agreed to bring an impromptu message for the service and he chose as his text the story of Peter and Cornelius in Acts 10. We couldn’t understand what he was saying, but the Syrians could and we could see them nodding in agreement. As he told us on the journey home, Peter, a man raised with the Torah, defined by what he had known in his life, was asked to hold that identity loosely in his hands, to be able to relinquish it to bring the gospel to Cornelius and thus the Gentiles. This is a voluntary relinquishment of self that opens doors and allows conversations. It was a word we needed to hear as well. As we journey in this place where politics and war have torn so much from so many, we too, must relinquish our identities, to hold them loosely in our hands, that we might sit humbly with our brothers and sisters to listen and to learn. It is in these moments where true fellowship in Christ is experienced and the only identity we desire is to call ourselves followers of Jesus.